Canada’s top chefs have today selected two of Calgary’s young culinary talents to fly to Vancouver, on sponsor airline Air Canada, to participate in the national finals of the Hawksworth Young Chef Scholarship. The competition was extremely fierce in the kitchen at SAIT with Alex Edmonson and Coleman Everest both from MARKET, impressing the panel of judges enough to move on to the national final on September 17. Regional heats are also taking place in Vancouver, Toronto and Montreal to find eight finalists that will compete to win a $10,000 cash prize and and an international stage as the winner of the fourth annual Hawksworth Young Chef Scholarship. Each of today’s 10 competitors were given identical ingredients, provided by Gordon Food Services Canada, and allowed two hours in the kitchen to inspire the taste buds of the judges. Some of this year’s ingredients included whole rabbit, double-smoked bacon, fresh herbs and a wide selection of fresh produce and dairy products. Four identical main course plates had to be completed within the two-hour time period or marks were deducted from the final score. Main course plates had to represent an a la carte sized portion with the inclusion of 120 grams of protein, one starch garnish, two vegetable garnishes and one sauce. 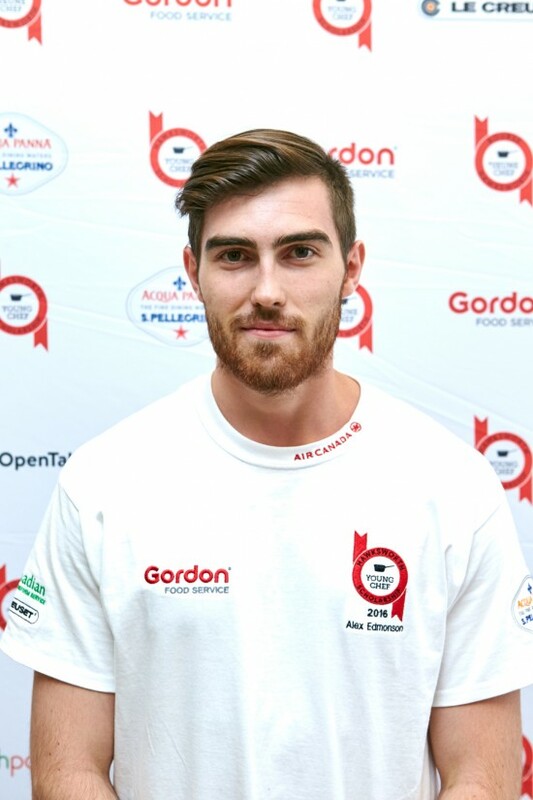 Alex Edmonson was first overall in the Calgary heat, impressing a panel of chefs that included Connie De Sousa, Michael Noble, Michael Allemeier, Eric Hendry, Kristian Eligh and David Hawksworth. While executing his main dish, stuffed rabbit saddle, Edmonson showed finesse and know-how by utilizing many of the different ingredients from the pantry to create a flavourful and exciting dish. His abilities translated into an impressive first place showing. As a reward for his hard work in the kitchen, Le Creuset provided him with an olive wood knife. Taking place on September 17 at Vancouver Community College, the final round of this national competition will see the finalists use mystery ingredients from a black box, which will be revealed only moments before the competition clock begins to countdown. The winner, chosen by a prominent panel of Canadian chefs and food critics, will be awarded a $10,000 scholarship, international stage as well as prizing from sponsors Air Canada, San Pellegrino, Gordon Food Services and Le Creuset.